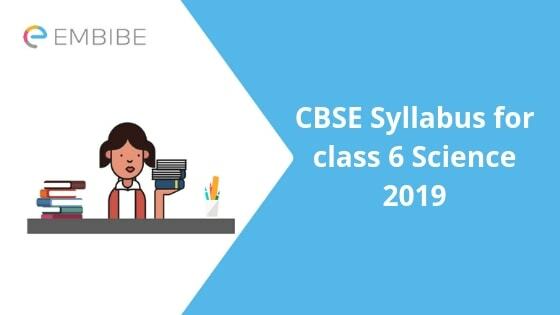 CBSE Syllabus for class 6 Science 2019 | National Council of Educational Research and Training (NCERT) is the approving authority for the Central Board of Secondary Education (CBSE) syllabus for each subject. This is one of the main reasons why NCERT books are a perfect study material for the CBSE syllabus. Students of Class 6 will have a single book for Science subject. The book will have a combination of the chapters from each section known as Physics, Biology, and Chemistry. There will be a total of 16 chapters. Each chapter will have a practice question series of various types based on the trending exam pattern of the CBSE Syllabus For Class 6 Science. The Biology section of the syllabus will focus on the concepts like food, body study and movements, organisms and the surrounding, water etc. Moreover, the Chemistry section will introduce the students with various materials like fiber and fabric, various substances and the separation, air, and gases etc. The Physics section will focus on the sections like Lights, Shadows, and reflections, Magnetism, Electricity, Power and Circuits etc. As the syllabus consists of 16 chapters as the total, NCERT book for Class VI is the best study material to read. The book is designed specifically to cover up the CBSE syllabus as a whole. Chapter 1 Biology- Food: Where Does it Come From? Here, we will discuss all three sections in detail. As you know that the major sections of Science i.e. Physics, Chemistry, and Mathematics are included into one book, you should have the idea about the curriculum which will be followed throughout the whole CBSE Syllabus For Class 6 Science. A- Physics- We are starting with the Physics section as Physics is one of the most important parts of Science syllabus of any class. The Subject begins with the study of Light, Shadows, and Reflections. It introduces the students with the concepts of the same and their applications in real life. The other section will include Electricity and Circuits, it will apply the principles of power and its sources into the chapter. The Last Physics chapter will include the study of Magnetism and its concepts. The chapter will talk about the magnet force and its principles of working. Also, the chapter will introduce students with concepts like the behavior of magnets into various situations. B- Biology- As you know that Biology is a study of living organisms, the biology section will begin with the study of food and its sources for the beginning. Moving forward, the concepts of food components will become part of this chapter. Apart from the food, biology section will talk about the plants, body movements of the living creatures, the surround and the nature of the living organisms, water, and the garbage generation and disposal. C- Chemistry- The chemistry section is a study of the chemicals and its combinations. Here, the students will get the introduction of the basic concepts of the Chemistry which will be beneficial for them in higher studies. The Chemistry section will have the study of Fibre to the fabric as the first chapter, materials into the groups, the changes around us caused by the chemicals, the air and the gases included in it. The section will be taught to the students with the help of various formulas, diagrams, and concepts proposed by expert chemists. As we have discussed all the required details for the subject, we suggest you read the NCERT book for the best understanding of the subject. Also, it will be a plus point for your exam if you arrange the previous year question papers and practice on them. The previous year question papers will provide you the idea of the probability of the sections. Moreover, you will be able to practice the questions to memorize the concepts perfectly. We hope that our article on CBSE Syllabus For Class 6 Science was useful for you. If you have any query or feedback to share with us, please feel free to drop a comment below. We will get back to you within a very short time. For now, we are ending this article with the best wishes for your future exams and challenges on behalf of the whole team of Embibe.